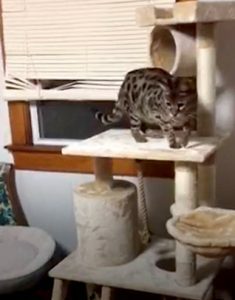 After a cross-country journey, Savannah cat Maximillion is finally at his forever home! Who drives over 1200 miles to make sure a recently surrendered Savannah cat has a forever home? We do of course ! Thanks to your support, committed volunteers and staff, we always find a way to bring them home – no matter whether they’re big or small. 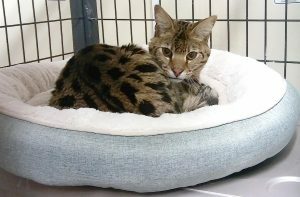 We recently received an email from a woman who just took in an F1 Savannah cat as a foster. She quickly began researching the breed and our work and contacted us within 24 hours. She hoped we could be a forever home to 3-year-old Maximillion. Maximillion was originally purchased from a breeder and was living in a home in New Orleans with 3 other hybrid cats. When Maximillion began chewing on blinds and soiling outside the litter box, his owner decided to surrender him to a local rescue. It’s a story we hear all too often. We’re so thankful for the commitment and knowledge of the foster in finding Maximillion a perfect home. You can imagine, the foster fell in love with Maximillion right away. He was known to be social, but since his world had been turned upside down, he was now frightened and unsure. The foster communicated with us frequently about diet and essential oils to decrease his stress. She even donated her time to drive him 1200 miles to meet our volunteer team half way from Louisiana! It takes a village of good and caring people to help cats like Maximillion. He’s very thankful to have all of you on his side! We look forward to sharing more news about Maximillion in the weeks to come. He’ll receive a thorough intake exam, be quarantined in the hospital before meeting his new friends in Hybrid Haven. If you’d like to help, please check out our Sponsor-A-Wild-One program HERE.